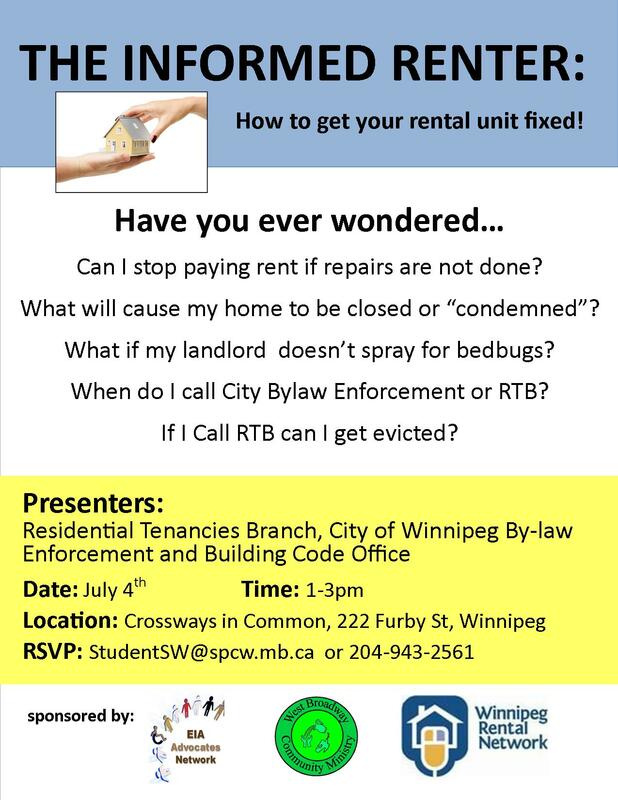 Are you a renter in Winnipeg with questions? If you are there is a Renter Meeting for you with the Residential Tenancy Branch and the City by-law department presenting. 1. Can you stop paying rent if repairs aren’t completed? You know, if you broke the door or the fridge. 2. What can you do if you find bedbugs and your landlord doesn’t spray? Shouldn’t the landlord be responsible for bedbugs, even if they are brought in by tenants. 3. What qualifies the apartment you rent as being condemned? If you don’t take out the garbage or clean up the yard could it lead to you having to actually move out. 4. When is it right to call the City by-law department? Do you only do this after you have been evicted? 5. If I call the Residential Tenancy Branch will I be evicted? You’ve heard about all that spying in the United States. Has the landlord bugged your phone? All your questions will be answered July 4th, 2013 at the big meeting. Presenters will include the Residential Tenancy Branch and the Winnipeg By-law and Enforcement Office. If you are a Winnipeg landlord you can arrange your own meeting. After all, landlords are all raking in the money by running slums and ripping off tenants, right? Or does the government want to portray hard-working small landlords that way. They seem to think small landlords don’t face challenges. Small landlords who, in reality, create high quality, affordable housing for thousands of people in our city. Small landlords who increasingly have to deal with tenants who don’t pay rent and don’t respect our properties. Small landlords who are true stake-holders in the economic growth of our province. Maybe the government should hold a meeting for us showing their appreciation of what we do.